Space and time occupy a strange position in our conception of the universe. We readily admit existence to things we can see and touch like tables and chairs – these things definitely exist. There’s some question as to whether things like electrons and subatomic particles actually exist, but on the whole physicists would maintain that these things existed too as we can manipulate them directly in the laboratory. But what about time and space? We can’t interact with either of them individually in the way that we can with tables and chairs, or even with subatomic particles. Time and space both seem to be something, but do they exist in the same way that this keyboard I’m using does? There is a split in the philosophical community with regards to this issue. By and large, the majority of philosophers of physics claim that space and time are real and important entities, but there is a small faction who maintain that space and time are just useful theoretical constructs that don’t have the independent existence we sometimes attribute to them. The debate in its modern form can be traced back to Einstein’s discovery of Special Relativity and the conception of Minkowski spacetime. I’ll start with Geometricism because it is the position that is favoured by most philosophers of physics, and is the idea that is most present in popular science. 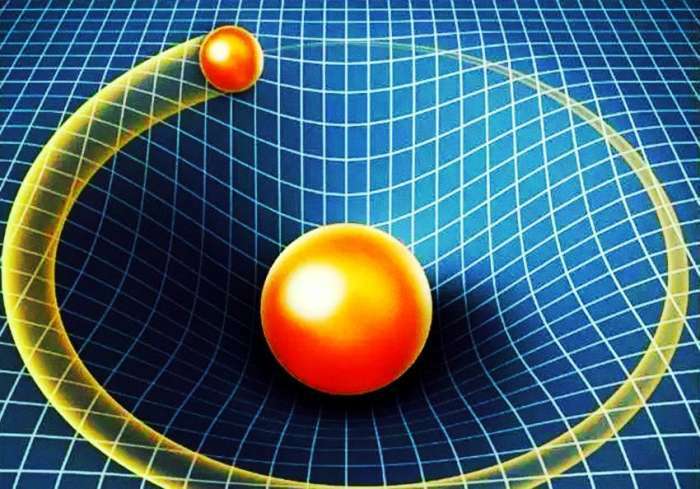 Anyone who has read a popular science book will be aware of one of the fundamental tenets of General Relativity: that matter warps the shape of spacetime. The planets orbit the Sun because the massive Sun is like a bowling ball on a sheet of fabric. The Sun causes the fabric to warp in the middle and the planets follow straight lines on this warped surface. It was seen as a great triumph of General Relativity that spacetime was no longer some ethereal entity that acted on matter but was never affected by it in return. Spacetime took on a dynamic role in General Relativity, being shaped by matter but also telling matter how to move. A short summary of the content of General Relativity would be that all things move in straight lines called geodesics (so long as they’re unaffected by external forces other than gravity), but the shape of space determines what counts as a straight line. The planets move on what appear to us to be ellipses, but in actual fact the planets are moving in straight lines through spacetime because the Sun has curved it. When we are looking for a scientific explanation of how the planets move, we will resort to describing the shape of spacetime – the planets move how they do because of the shape of space. This is the crux of Geometricism, that spacetime is real and tells matter how to move. It shouldn’t be too surprising, given that he developed most of the General Theory of Relativity that Einstein was a Geometricist later in his life. There is a camp in the philosophical community however that thinks Geometricists have got the wrong end of the stick. Dynamicists will maintain that space and time are actually just convenient codifications of the way in which matter behaves. Interestingly, at its conception, Special Relativity was a dynamical theory. It was all to do with the way in which phenomenological objects such as rods and clocks behaved when they moved. After Einstein’s papers had been published, it was Minkowski who suggested that Special Relativity implied that spacetime had a Minkowskian geometry. Up until Relativity, it had always been thought that spacetime had a Euclidean geometry – that parallel lines never meet and the angles of a triangle sum to 180 degrees. Einstein was originally dismissive of the proposal to view the content of Special Relativity as implying we live in a Minkowskian world, not a Euclidean one. Einstein thought that the abstract mathematics that described Minkowskian geometry was just a superfluous codification of the dynamics of real objects. With his development of General Relativity, Einstein succumbed to believing in the reality of spacetime and its importance in telling matter how to move. But a considerable number of philosophers of physics now support Einstein’s original view that it was the dynamics of matter that is fundamental and spacetime is just a convenient codification of the dynamics. Dynamicists claim that there is a lack of a mechanism to describe how it is that spacetime tells matter to move. It’s all well and good saying that matter follows geodesics in spacetime – but how does matter know that it’s following a geodesic? By what mechanism does it interact with spacetime? The Dynamicists claim then that the lack of a mechanism shows us that spacetime does not really exist. Spacetime is just a codification of the dynamical behaviour of matter, which is why we don’t observe or interact with spacetime ourselves – because it doesn’t exist. Spacetime is certainly a useful abstract mathematical entity which allows us a much better intuition behind the dynamical behaviour of matter. But just because it is such a good tool, that doesn’t imply that it actually exists. Whatever the case, academics are still torn over whether matter or spacetime should be the fundamental entities in physics.